We customize our solutions for each of our clients ~ from SR&ED support to HR consulting to accounting services. Once in a while, we are asked to partner with a company to deliver multiple services, giving us a unique vantage point. 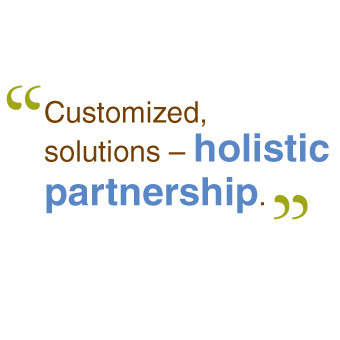 Things can get even more interesting when holistic partnership enables efficiencies and inspired consulting. One of the great advantages of combining the skills of different disciplines is that we can go beyond the traditional model of delivering services from a 'silo' of knowledge to share information across knowledge bases. Speaking practically, this means that as our client relationship deepens, so can your benefit, enterprise-wide. Consider a small business that has great technology and ideas and wants to grow. As close partners with small to medium business owners, we understand and support their business strategy and goals. Our SR&ED support services can assist clients with a claim for ITCs, which in many cases generate cash refunds that improve their working capital position and their ability to achieve aggressive benchmarks for growth. During the SR&ED process, we transfer knowledge, not just in the SR&ED claim process, but toward helping to improve the quality of accounting information to manage better. Good accounting improves the SR&ED recovery and has the added benefit of helping the owners understand the story behind their numbers. Then perhaps the company wants to reinvest their improved working capital into strategic hiring to boost their intellectual property gain or improve their financial reporting. We can help with the HR support needed for that as well. Because we are working from a consistent view of a company's strategy across all service lines, we can deliver this work efficiently, with no disconnects across services or differing disciplines, supporting and rounding out your team. So whether you just need support on a particular service or a tailored bundle of services, we are here to help.